Corn Upma is my favorite dish.I make it every time when i feel hungry.You can served it as a regular breakfast with tea.In this i used a corn to make this corn upma. But you can also use a peas instead of corns and make peas upma. Enjoy this tasty dish with you family and friends. Mix 3 tbsp oil ans rawa suji in flat glass dish. Spread evently at the bottom of the dish and microwave it for 2 & 1/2 minutes. Mix again and microwave for another 2 minutes. Remove & immediately mix well.Keep aside. In a separate dish, put 1 tbsp oil. Add mustard seeds, curry leaves, green chilli, onion, beans, chana daal and tomato. Microwave it for 4 & 1/2 minutes. Add salt, red chilli powder, water, corn and lemon juice. Gradually add suji, stirring constantly. Microwave covered for 4 minutes. Remove cover and microwave for 1 minutes and then serve. Roast a rawa suji in a pan and transfer it in bowl. Take a pan, add a oil and add mustard seeds, when it roasted then add a chana daal and cook it few minutes. Now, add ginger and onion and cook til becomes light brown. Add tomato in it and cook for 2 minutes. Add salt, green chilli, beans, red chilli powder, beans,curry leaves, lemon juice and cook for 2 minutes. Now add a corn and water. When it gets boiled then add rawa suji. Cook it for for some times till water is absorbed. Before serving garnish it with finely chopped fresh coriander leaves and serve hot with tea. 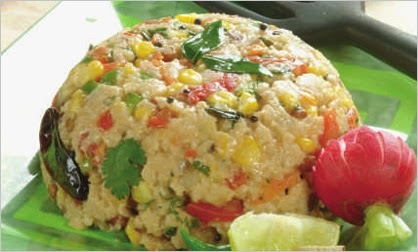 You can also use a boiled peas instead of corn and enjoy pea upma.